Hey!!!! Today is the day: The Casual Veggie goes live and you can actually buy it here. I mentioned this in a post dedicated to The Casual Veggie last week. This is an e-book brought to you by Mollie from Parsley and Pumpkins, written with the collaboration of other 48 bloggers. There are 166 veggie recipes in the book, divided into several chapters, each dedicated to a vegetable like broccoli, pumpkin, peas, tomatoes and so on. So whenever you get stuck and don’t know what to do with the irresistible stuff you just bought on a whim at the farmer’s market or with the weird kohlrabi in your vegetable box, here is the answer. If you buy this book using the link on my blog, you will help support Where Is My Spoon and I already thank you for that. I made this dish especially for the link party today. The motto of the party is veggie drinks and appetizers and as I have bought two lovely beetroot (also on a whim, they just looked so good) at the Turkish store a couple of days ago, I thought this would be a great occasion to try a recipe that, in my opinion and for my style of cooking, is quite unusual. 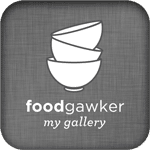 I found the recipe in my absolute favorite food magazine Good Food. I started reading Good Food while living in London before the birth of my son and just loved it from the very first moment. I brought home some issues but could not buy it anymore for years. Then on vacation in Romania a few years ago, I discovered that I could buy the Romanian version of it there. So my cousin took a subscription and is sending me the magazine whenever possible and recently I also subscribe to the kindle English version. So I found this recipe in a recent issue of Good Food but changed it a bit, I am seldom capable of following a recipe to the letter. And I loved it. Nothing for the children but I knew that from the start, so there was no disappointment there. 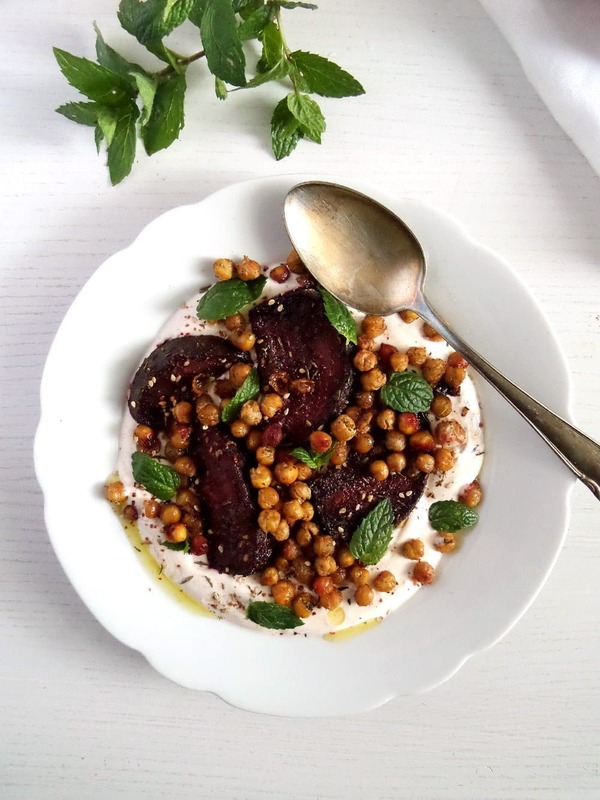 Sweet and earthy roasted beets, on a bed of creamy, hot and tangy yogurt and topped with super-crunchy and unbelievably tasty roasted chickpeas. Heaven! The spice mixture will be more than you need for this dish. You could make only half of it if you wish, but I wouldn’t recommend it. Make the whole batch and use the rest over the next days (or even weeks I could imagine) either stirred into yogurt or in salad dressings or sprinkled on top of vegetables or soup or whatever you fancy. It tastes just great. 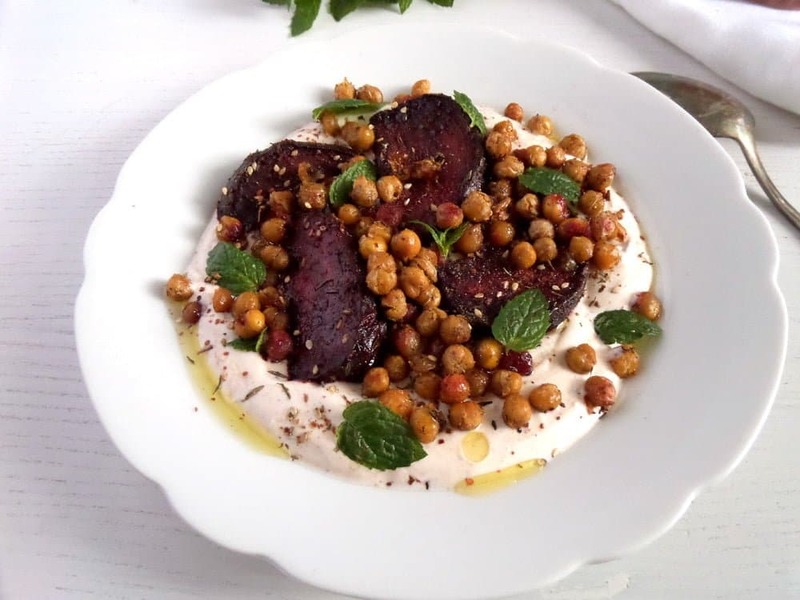 Beets + chickpeas = Yum! This dish sounds so flavorful. I love that the chickpeas and beetroot cook together on one pan so everything is ready at the same time and there’s very little clean up! What a great combination! It looks and sounds so flavorful! Hooray for the book launch! wow I NEED this in my life. It looks so good, Adina. Okay, my mouth is seriously watering. 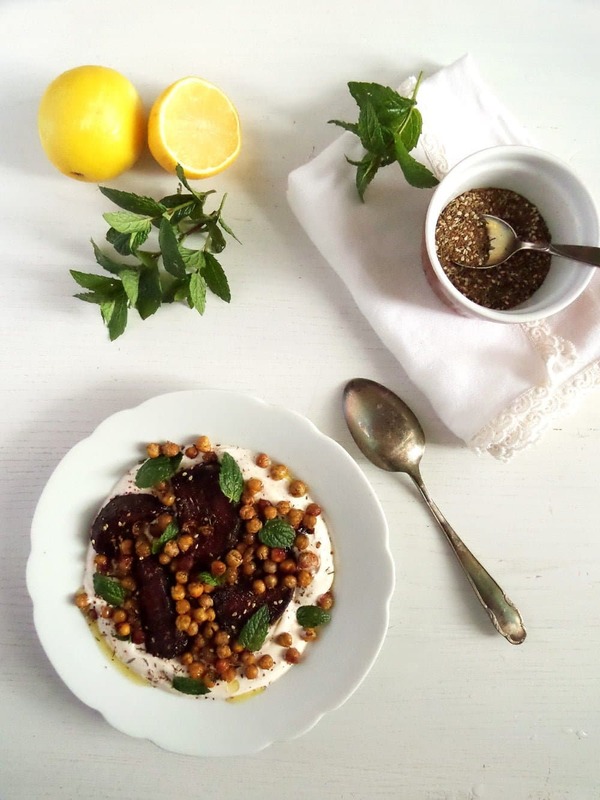 I love anything and everything with beets, and the crisped chickpeas on top…. holy wow. I am making this tonight! I hope you enjoy it. The chickpeas are, like the Germans like to say: der Hammer!!! The balance of flavors in this dish sound so delicious! What a fabulous looking cookbook too. I’m going to have to check it out! That would be great, Rachel. I do hope you like the book! This looks and sounds amazing Adina! I love that the vegetables are all on top of creamy yogurt, looks like a perfect lunch to me! Oh wow! 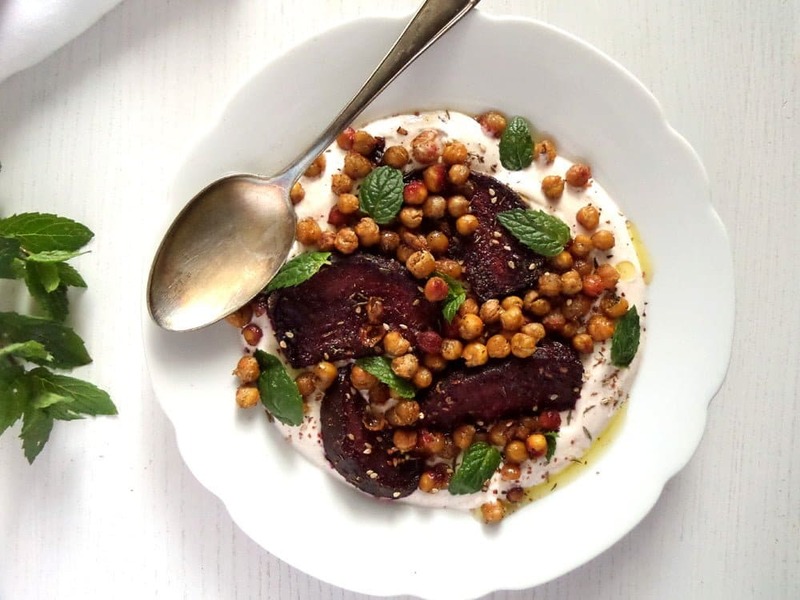 Beet and chickpeas are a deeeelicious combo. Love how gorgeous, delicious and healthy this platter looks. And that yogurt addition is killer. SO good. This dish sounds lovely, Adina! I adore roasted beets (I think they are one of my favorite vegetables, in fact), and this sounds like such a great way to use them. The spices and crispy chickpeas sounds so yummy, too! Thank you, Willow. I love rootbeets too.